Satellite TV is the best way to get English language TV programs into your home on Okinawa. If you live off base and are wondering which channel HBO is on, stop the channel surfing because you are in for a big surprise. In Japan, there is no HBO. There is no Fox News or Comedy Central either. Some may think this is a big letdown, but if you are willing to open yourself up to local TV, Japan has some very entertaining TV programs. While living on Okinawa Island it is very useful to learn Japanese. Fortunately, the popular pastime of TV is not only a great form of entertainment, but a fabulous way to learn some Japanese too! Many words can be learned simply by watching Japanese TV programs. You may learn that “oishii” means “delicious” by watching one of the food channels or that “kirei” means beautiful by watching a nature show. If you are not a TV fanatic but like to watch a few programs now and then, Okinawa offers an antenna adapter box with five channels for free. Well, almost free. One of those five channels is NHK, and every year an NHK representative will contact you and ask if you have been watching NHK that year as you must pay their fee. To Americans, this may seem a very different and strange way to collect fees from households, but it does go to show you honest people exist in the country as NHK has done this for decades. If the steady stream of “almost free” food programs and talk shows begin to bore you, you can subscribe to the Japanese cable network called Okinawa Cable Network (OCN). With OCN there are plenty of Japanese channels to choose from; unfortunately, they provide very few English-language channels. However, the great thing about OCN is they also provide Internet service so you can combine two services with one company. If you feel homesick and want to watch shows from America, you can get satellite TV, which offers a multitude of US channels. To purchase it you will need to contact a satellite installation company such as Sun Friend Satellite for installation. This company can provide you with a rental decoder and all the equipment and installation for English TV. 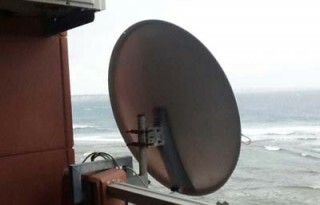 But those who own a satellite antenna must remember that Okinawa has some serious typhoons that pass through, so make sure you take your antenna dish down before strong winds reach the island. If you have an Internet service already, you can always subscribe to Netflix and watch thousands of movies and TV shows. You can attach your computer to your TV with one simple cable and enjoy all of these on the big screen. You can even watch your favorite YouTube video this way! As Okinawa is hit with many typhoons and rainy days, staying indoors and watching TV is a great way to pass the time. As you have read, there are a lot of TV options to choose from, but let’s not forget that the most entertaining thing on the island is the beauty that lies just outside your doorstep. Whether it be a sunset, sunrise, a waterfall or some palm trees swaying in the wind, enjoy all the natural beauty that Okinawa has to offer.